Expecting to see Robert Llewellyn picking up one of his well-known pals in his Toyota Prius when you tune into Dave tonight? If so, we’re sorry to say you may be disappointed: Carpool is now on a mid-season break until the New Year. The first half of the series has been packed with laughs – from Robert and Chris Addison revealing secrets about their love lives, to Rob Brydon doing his impression of former Prime Minister Tony Blair, to the Red Dwarf reunion between Robert and Craig Charles. It’s impossible to choose our favourite moment from the series so far. 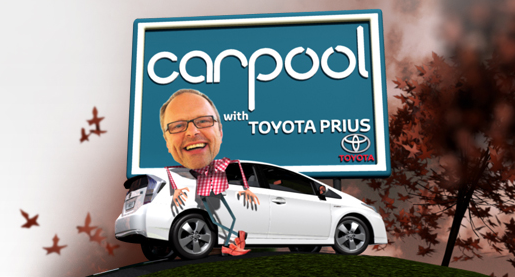 Carpool will be back on your screens on a new day when it returns on Wednesday 5 January 2011 at 8.30pm on Dave. Missed an episode? Don’t worry – as an additional New Year bonus you’ll be able to catch repeats of the early episodes, every Saturday at 6.30pm from 8 January 2011. If you can’t wait until then, head on over to our YouTube channel, where you’ll find highlights from the first half of the series as well as our Hybrid Mythbusters special.